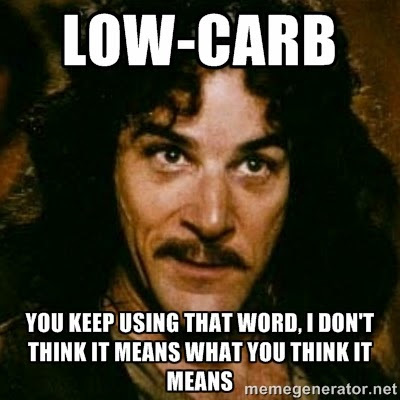 Weighty Matters: "Low-Carb" Diets, Peer Review Failure, The Media, and Us. "Low-Carb" Diets, Peer Review Failure, The Media, and Us. A few months ago a study was published in JAMA entitled, "Effects of High vs Low Glycemic Index of Dietary Carbohydrate on Cardiovascular Disease Risk Factors and Insulin Sensitivity: The Omni Carb Randomized Clinical Trial" and it proved to be interesting and important enough for the New York Times to cover it with Anahad O'Connor's piece, "Questioning the Idea of Good Carbs, Bad Carbs". O'Connor's coverage is solid, and if you're curious about the study's results, and don't feel like reading the full text (also linked up above), have a click, but my question is simple. Is there a problem with discussing "low-carb" diets when the diets themselves aren't in fact low-carb? The New York Times rightly highlighted the fact that really the study was of the impact of glycemic index. But have a peek at MedpageToday's (a newswire read by many MD's), headline, "OmniCarb Study: Cutting Carbs No Silver Bullet"And I don't blame MedpageToday for it either given that the study itself describes one of their diet arms as "low carbohydrate". But a diet containing 40% of calories coming from carbs to me anyhow, just isn't fairly describable as "low-carb", and yet that's what Omni Carb's "low-carb" arm contained. Sometimes too, unlike this study, there are times when while the diet prescribed is low-carb, but the adherence to it isn't, and yet the authors still report their findings as if they pertain to the prescribed, rather than the consumed, diet. Given the battle lines that are drawn around dietary dogma, and that many don't read beyond headlines, I think it would be great if there were some agreed upon "low" nomenclature. If diets must be labeled as "low-carb", or "low-fat", is there no way to ensure that journals won't allow such descriptors if the diets that were actually consumed (let alone prescribed), don't in fact meet some very basic and even conservative definition of "low"? So what should the cut-off be? I asked on Twitter and there wasn't any clear consensus. But for what it's worth, a recent low-carb review paper published by Richard Feinman et al. in Nutrition defined "low" carb as being either fewer than 130g of daily carbohydrates, or a diet whereby carbohydrates contribute less than 26% of total daily calories (thanks @RobertOhMD for pointing me to it). Both values sound fair to me. What say you?